Atli teaching Lorrie and Gaefa on the track. The Atli clinic was last weekend. It was a great success and everyone walked away feeling like they learned something. Atli had a demonstration both days right before lunch that were really informative. Sunday the participants all got individual sessions with Atli and that turned out to be very popular with the riders. Overall a great event and we can't wait for the next one in the spring. Check the photos from the clinic at the CIA website. Atli teaching Anne-Marie and Huni. The yearly BLUP breeding prediction has been updated in WorldFengur. 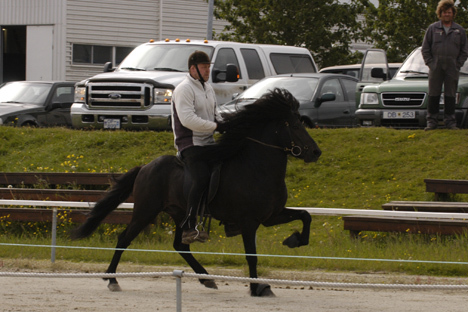 Hrafn has a total of 118 and is currently the highest of the Stallions located in US in WorldFengur and Thor is also in the top 10 with a total of 114. Click here to see a report of top 10 it is a PDF file. 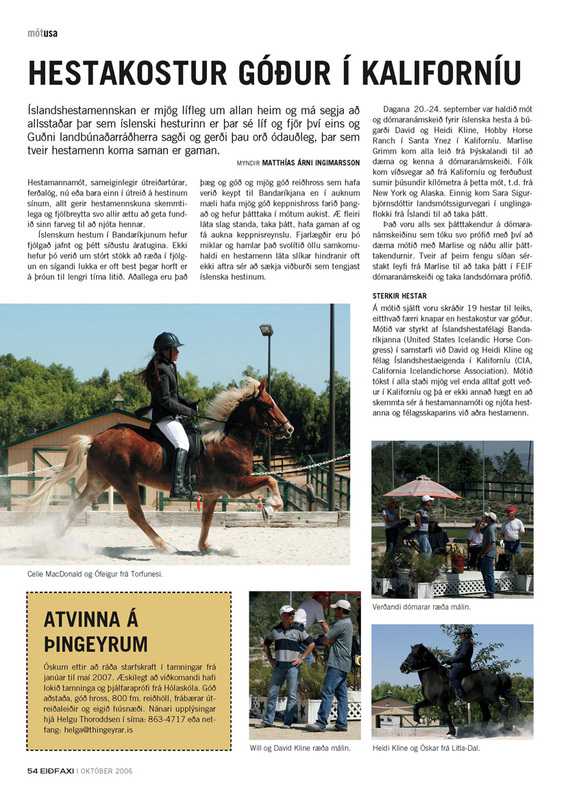 The new Icelandic Eiðfaxi came out in Late October and there is an article about the September show held at David and Heidi's Hobby Horse Ranch here in the Valley. Matti came and took some photos and submitted them to Eiðfaxi and they published them. It should be in the next issue of Eiðfaxi International. 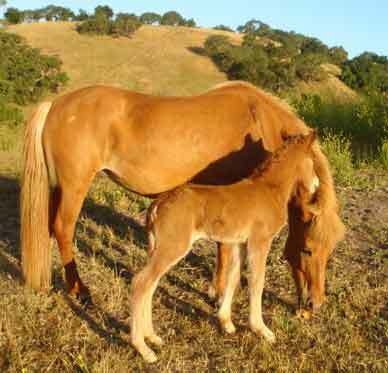 We bred 3 of our own mares here in Santa Ynez and they are all confirmed pregnant. 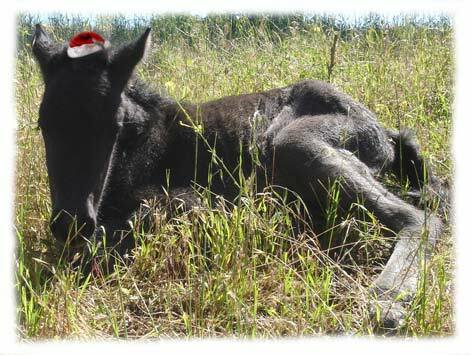 So we are expecting 3 foals next year. 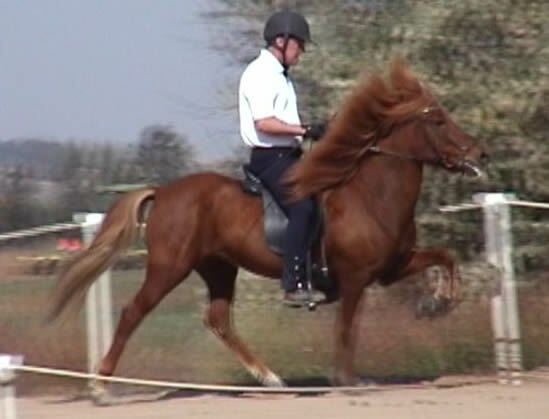 Fjalladis vom Wiesenhof and Perla fra Rauduskridu were bred to Thor fra Prestsbakka and Rak fra Akureyri was bred to Stigandi fra Leysingjastodum via AI. 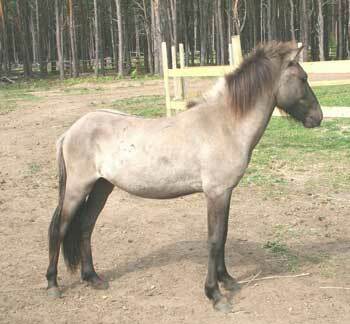 The mares in Iceland were bred too. 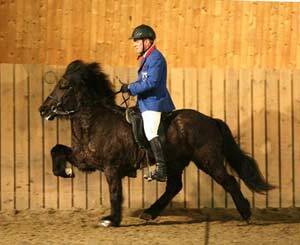 Gola fra Hofdabrekku was bred to the 5 year-old Landsmot winner Vilmundur fra Feti, Fjodur fra Asi was bred to and confirmed pregnant by Hrodur fra Refsstodum who received first prize for offspring at Landsmot this summer and Oskin fra Feti (S. Orri fra Thufu - D. Gola fra Hofdabrekku) was bred and confirmed pregnant by Kraftur fra Bringu the Icelandic Champion in Tolt and 5-gait 2006. The Monday after the show we packed up and left for Idaho with 4 horses. We drove 6 hours the first day and 14 the second day and arrived at Rocking R Ranch in Middleton, ID around midnight Tuesday. We picked Atli up at the Airport in Reno on the way since he missed his flight from Minneapolis to LAX Sunday night. The horses came off the trailer in better shape than us humans. The weather was beautiful the whole time we were there. 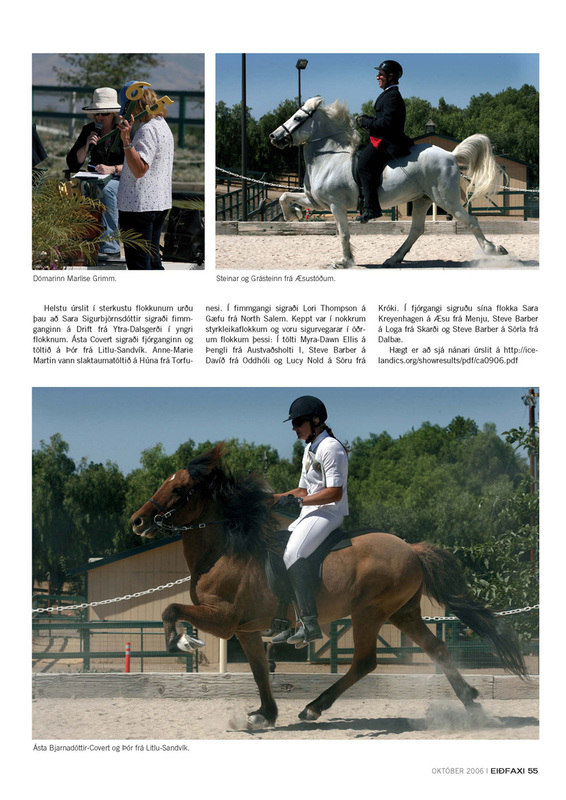 Fjalladis and Thor were highest in their age classes and both received over 8 for talent and overall. Tjaldur also received 8 for talent as a fourgaiter. Rich Porter and his family and staff did a fantastic job hosting the show at his beautiful ranch in Idaho. And of course the Cascade Club did a great job organizing and the program was very well done. Go to Worldfengur.com to see the results. 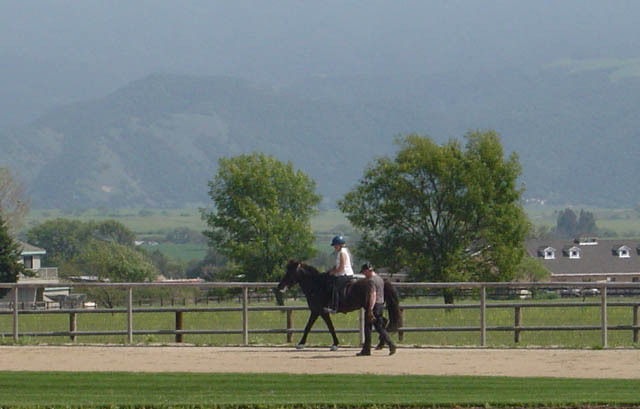 We are glad to be back home in Santa Ynez. 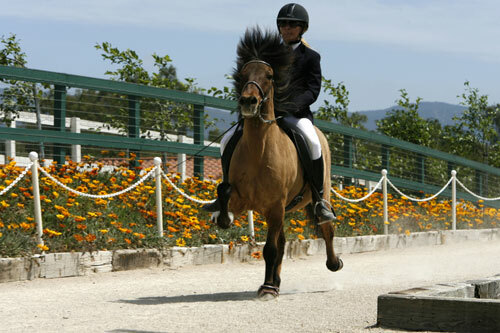 Now the next event is not until November when Atli comes and teaches a clinic here in Santa Ynez. Both the photos are from a video so that is the reason the quality is not as good. We are hoping to get some photos from the event and also from the SY Open show. Now everything is getting ready for this weekend Santa Ynez Open at David and Heidi's place Hobby Horse Ranch here in Santa Ynez. And on Tuesday after the show we will head to Idaho for the Cascade Breeding Evaluations. So the next couple of weeks are going to be eventful to say the least. Atli will be flying in on Saturday night and driving with us to Idaho. If you are planning to come to David and Heidi's show make sure to sign up on their website at www.hobhorse.com/entryform.htm. Bjartur is doing well in Canada. Kathy e-mailed us some photos of him and he looks a lot like his father. 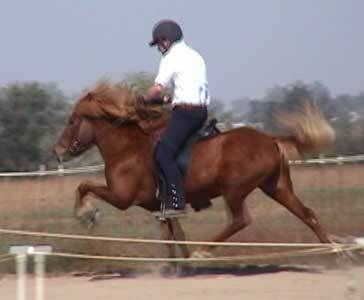 Hrafn's son Ylur frá Akranesi won the Open Four-gait with a score over 7 at a Large open competition last weekend. 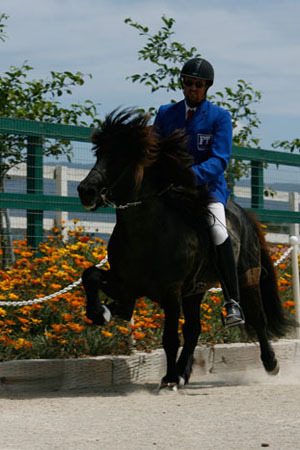 Tenor and Atli are going to compete for Iceland at the Nordic Championships held in Herning, Denmark, July 24th- 30th. They are heading to Denmark tomorrow. They competed at the Icelandic Championships last weekend where they were in the top 5 in both T2 and Pace Test and top 10 in Five-Gait. 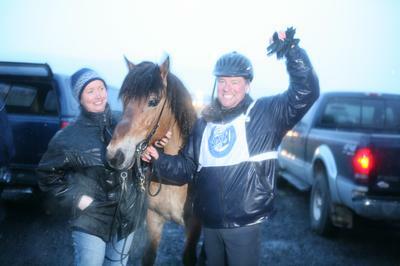 They won the Icelandic Championships Title for the Master Five-Gait combination the second year in a row. Dynjandi and Atli were 4th Master Level at the Icelandic Championships in Four-gait and Eldur fra Holi and Bjarni were 6th. 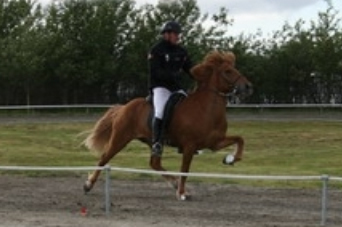 Bjarni rode Eldur also in Open T2 for the first time and they were 3rd in the open class. Here are some of the results from the Icelandic Championships..
We are leaving for Iceland next Wednesday to go and watch the Icelandic Championships held by the club Gustur in Kópavogur (Reykjavík area). 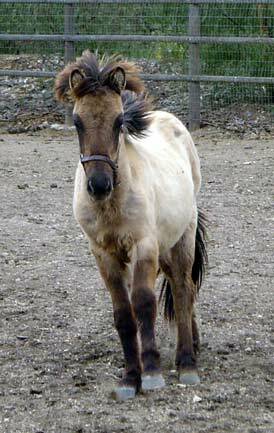 We will go and hopefully see the two new foals that Gola and Fjöður had in Iceland this summer at the Farm FET. 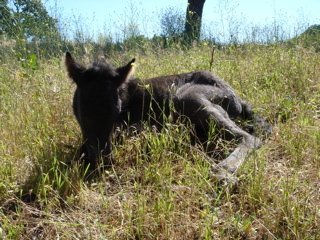 Fjöður had a bay filly by Víðir frá Prestsbakka (daugter of Þór's sister Gleði frá Prestsbakka and Keilir frá Miðsitju) and Gola had a bay colt by Skrúður frá Litla-Landi only 2 days ago. Atli just confirmed that he is coming to Flying C to teach a clinic November 18th and 19th, 2006 Private lessons available Friday November 17th. Atli has been coming to Flying C to teach since 1998. His clinics are always full so be sure to reserve your spot in time. For more information e-mail us at asta@tolt.net or call us at 805-688-1393. 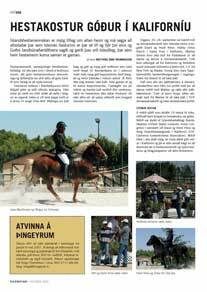 Anne-Marie's horses Dynjandi fra Dalvik and Tenor fra Ytri-Skogum are both going to Landsmot for the Club Sorli. 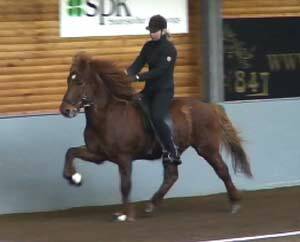 Atli will ride Dynjandi in B-Class (four-gait) and Tenor in A-Class (five-gait). Atli has other horses qulified for Landsmot as well both as Breeding horses and in the competition. More photos from the CIA Open. simnet.is/uno contact Matthias Ingimarsson at mai@centrum.is for more info on how to purchase. Our mare Perla had her baby this morning. 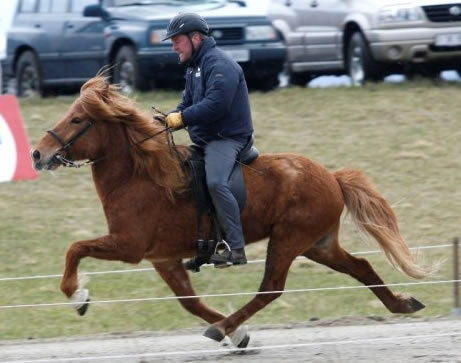 My Dad Bjarni took my gelding Eldur to an open World Ranking competition in Iceland last weekend and they won Tolt and Four-gait. They scored 6.73 in the Four-gait final and 7.44 in the Tolt final. Rak had a little colt May 23rd. 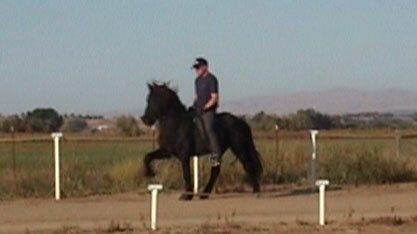 His sire is Hrafn fra Gardabae. 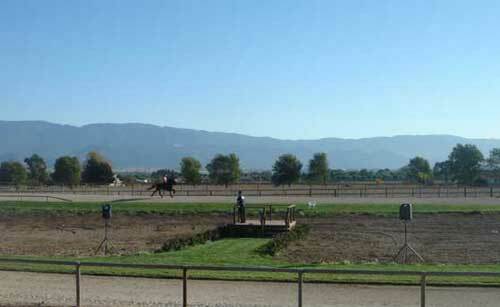 The CIA Open was held at Hobby Horse Ranch this past weekend. 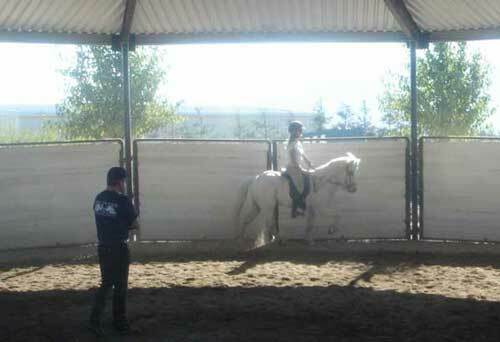 We took 9 horses from Flying C and had a great success. Einar Ragnarsson flew in from Iceland to judge and David and Heidi did a fantastic job at organizing and hosting the show! - Anne-Marie won Open 4 gait on Blaer fra Sigluvik with a total score of 7.40 she also won Tolt 2 on Huni fra Torfunesi with a total score of 7.75 and placed second on Blaer in Open Tolt with a score of 7.50! - I rode Hrafn fra Gardabae and Thor fra Litlu-Sandvik in 4 gait. Thor had the highest score in the preliminary with 6.80 and Hrafn was 5th with 6.10 so I decided to take Hrafn to improve my scores and learn. I placed 4th with a score of 6.70. I was second after in Tolt 2 on Dreyri fra Saurbae with a 6.25. In the Open Tolt I was first place in the preliminary with a score of 7.33 and I scored the same in the finals and ended in 3rd place. - Will dusted off his saddle and rode Tjaldur vom Lindenhof in the Open Tolt. After being tied with Anne-Marie and Heidi Kline in the preliminary with 6.70 he rode Tjaldur to victory with a score of 8.0 overall!! He received 8.0 for Slow Tolt, Speed changes and Fast Tolt. 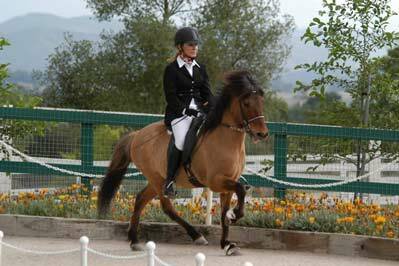 - Linda won Novice 4 gait on her horse Hrolfur fra Hafrafellstungu 2 with a total score of 6.00! 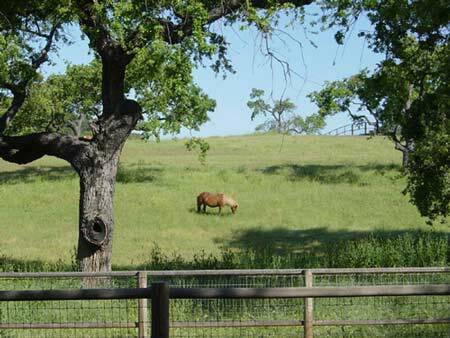 - Lorrie, Lucy, Cait, Nikki, Heidi and David all did a great job too riding their horses. 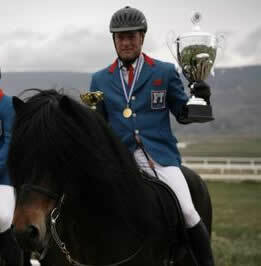 - Einar chose one rider in each division as the rider of the show in each division. Lucy was the chosen rider in Youth, Willy Ma was the rider in the Novice/Amateur and Anne-Marie was the rider of the show in Open. We all want to thank Atli for his help and support! Click here to see more photos from Willy Ma. Atli Won the open Four-Gait on Dynjandi at the Reykjavik Championships and Hrafn's son Ylur was second. Here are the final results from the Four-Gait finals. Reykjavik Championships are now in Iceland. The Fourgait preliminary were held last night and Anne-Marie's horse Dynjandi frá Dalvík is first place in the open class with Atli Gudmundsson. They scored 7.03. 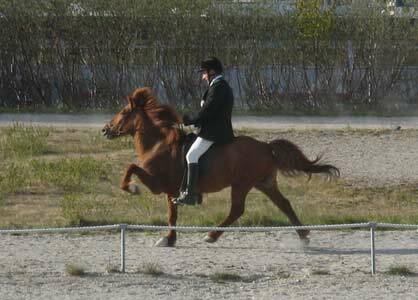 Hrafn fra Gardabae had a son Ylur fra Akranesi placing 3rd also in the open class scoring 6.93 rider is Sigurdur Sigurdarson. 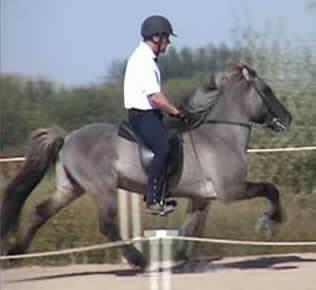 38 horses and riders were signed up in The open Fourgait. Finals are on Sunday. Rak and Perla are due in the end of the month and beginning of June. They are getting bigger every day and we can't wait to see the babies when they are born. 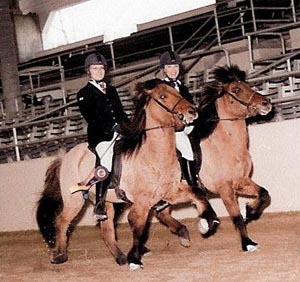 They were both bred to our stallion Hrafn fra Gardabae. We will keep you posted as soon as they are born. Bjartur running around at his new home. Atli won the Master competition in Iceland! The Master competition has been going on in Iceland all winter and Atli paricipated. They competed every two weeks in different diciplines. 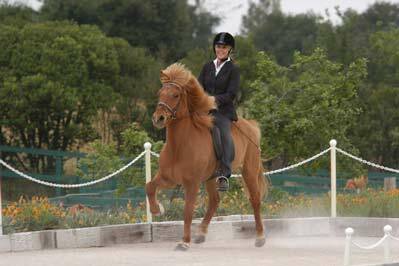 Starting with Fourgait February 23rd, Tolt, speed pace and trail class in March, Freestyle dressage and five gait in April and ending in May with Pace test and 150 m pace. He needed to win or place second in the last event in 150 m pace to win the total and he placed second on Snudur fra Husanesi and beat Sigurdur Sigurdarson by one point and the titil "The Master of the Masters!" 1. Atli Guðmundsson 44 stig. 2. Sigurður Sigurðarson 43 stig. The Atli clinic was a great success. Everyone left happy and feeling like they learned a lot. Atli will be back in the fall. We will post the dates on our event page and the CIA website as soon as the dates are finalized. Bjartur left for his new owners in Canada last night. It was sad seeing the little guy leave but he was so good loading into the trailer. 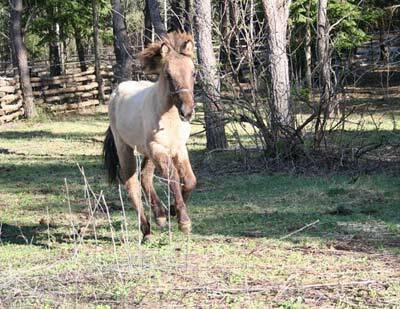 He followed Buffalo Bill (the mini) right in the trailer where the hauler had a stall ready for him with bedding and food. I look forward hearing from his new owners once he has arrived at his new home at Bonaventure Farms, Ontario, Canada. Just got back from Iceland after 4 days there. I rode in the annual Women's Tolt and borrowed Anne-Marie's gelding Dynjandi frá Dalvík and after riding him twice I rode him in the open class and we ended in 6th place out of 26 pro women. Pretty happy with that. 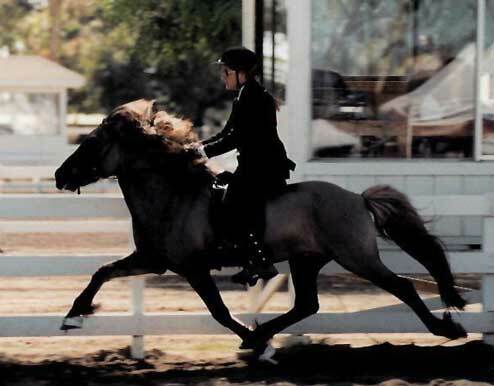 My mom rode my horse Eldur frá Hóli and was 4th in her class out of 40 women. There was a total of 120 women signed up in 4 different levels. This is one of the most popular open competition in the spring in Iceland and always fun to participate. Here is a photo of Dynjandi and me in Slow tolt in the finals. Now the annual meeting is over and we are back from Dallas. It was a good meeting. It was also really nice to see so many people there and some we hadn't met yet so that was really nice. The show was really good. Anne-Marie did really well she was second in the Open Tolt and Four-Gait finals on Blaer as well as winning Tolt 2 on Huni. I took Thor and we won all the classes we entered. We were really happy with the weekend in Burbank and we are looking forward to the next show. Here is a photo of Anne-Marie and I after the Tolt 1 Final where we took first and second. The show season is starting this weekend. We are only taking one horse to the show and Anne-Marie is taking two. So there are three horses going from here. The season starts in Iceland. 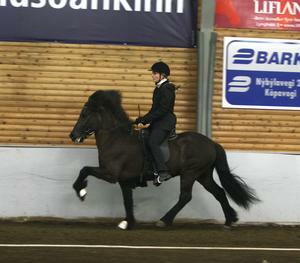 Atli showed Anne-Marie's new gelding Dynjandi frá Dalvík in fourgait at the master's competition and was 4th place. Dynjandi is getting a lot of positive feedback from the Icelandic Horse Press. Here is Atli and Dynjandi in Fast Tolt!